Tito Vilanova, the former Barcelona coach, has died aged 45 after a long battle with cancer. 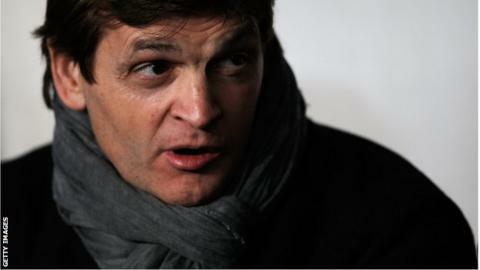 Vilanova had a tumour removed from his throat in November 2011 before suffering a relapse in December 2012. He stepped down as Barca boss last July to continue his treatment, with Gerardo Martino taking charge. "FC Barcelona is in immense mourning. Tito Vilanova has died at the age of 45. May he rest in peace," said a statement from the Spanish club. "The club wishes to express its most heartfelt sympathy to his family, who are being joined in these moments of mourning by FC Barcelona members and fans all around the world, as well as the rest of the footballing and sporting world. "The Vilanova family has asked for respect for their desire for the strictest intimacy in the moments after his death." The club added that a "space for condolence" would be opened in the main grandstand at their Nou Camp stadium on Friday. The ex-Barca youth-team player was Pep Guardiola's assistant before stepping up to replace the now-Bayern Munich boss when he decided to take a sabbatical from football in June 2012. Vilanova had surgery in December 2012 and spent 10 weeks in New York having chemotherapy and radiotherapy, but he returned in March 2013 to see his side take the Spanish title in his sole season in charge. Barcelona won La Liga with a league record of 100 points from a possible 114, equalling the total achieved by Real Madrid in 2011-12. In addition, his side set a new scoring record of 115 goals in 38 matches. His overall La Liga record stands at 32 wins, four draws and two defeats, as Barca finished 15 points clear of runners-up Real Madrid. His team were knocked out of last season's Champions League after a 7-0 aggregate semi-final defeat by Bayern Munich. Tributes have been paid from many football coaches, players and clubs, with Chelsea boss Jose Mourinho saying Vilanova's death was "a sad day for football". Ex-Real Madrid coach Mourinho had several run-ins with Vilanova during his time in Spain, most notably at the end of the 2011 Spanish Super Cup. "Tito Vilanova was a greatly admired and respected figure, not just at Barcelona but throughout Spanish football, and his death will cast a sad shadow over the remainder of the season. "He will be forever remembered as the manager who led Barca to a La Liga record points tally (100) during his solitary season in charge, and also as the man who helped Pep Guardiola revolutionise football during four previous years as assistant, advisor and soundboard to his long-standing friend. "And more than that, he should also be recalled as a deeply honourable human being who met adversity and triumph alike with humility and dignity." "Tito Vilanova's passing is a sad day for football, for Barcelona and most importantly for his family and friends," said Mourinho on Chelsea's Twitter account. "On behalf of everybody at Chelsea Football Club I send my deepest condolences at this most difficult time." Lionel Messi, the star of Vilanova's Barcelona team, said on his Facebook page: "A person difficult to forget. I will always remember you. All my love to the family of Tito." Barcelona midfielder Cesc Fabregas said "there are very few" people like Vilanova, who the 26-year-old first met when he joined Barca's La Masia youth academy as a teenager. "Tito, thanks for all you have given to football and Barca. All fans love you and are eternally grateful," said the Spain international on his Facebook page. "I met you 14 years ago and I can say that there are very few people like you. Thank you for always trusting me to help me improve and overcome personal and professional obstacles." Meanwhile, Barca goalkeeper Victor Valdes, 31, described Vilanova as one of the best coaches he had worked with in his career. Atletico Madrid's former Barcelona striker David Villa, who played under Vilanova at the Nou Camp, added: "My condolences to the family and friends of Tito Vilanova. He has always been an example during his struggle. We will never forget." "Lots of support to all of Tito's family and friends. An example of fighting and strength for all of us. RIP," tweeted Real Madrid and Spain defender Sergio Ramos. The Spanish Football Federation added Vilanova would "always be linked to a unique generation of players".